... and masking the crimes under cover of Armada fever. Francis Bacon is charged with identifying the murderer by the Andromache Society, a widows’ guild led by his formidable aunt. Thomas Clarady and Lady Alice Trumpington help investigate while struggling to keep themselves out of hot water. Bacon must free his friends from the Tower, track an exotic poison, and untangle several crimes to determine if the motive is patriotism, greed, lunacy — or a mix of all three. Get this third thrilling tale in the award-winning Francis Bacon historical mystery series today! 5.0 out of 5 starsLove this author! I’ve read a few of the Francis Bacon books now - masterfully written, edited with care (YAY!! ), historically well researched, witty, great plots, with well rounded & engaging characters. Good reads!! 5.0 out of 5 starsWho is killing the recusants? 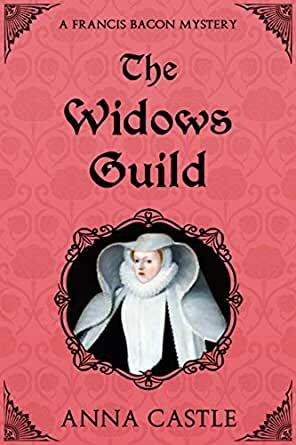 This series of books by Anna Castle is set in that difficult period of the late 1580's when the the throne of Elizabeth I was beset by enemies foreign (Spain) and domestic (Catholics who refused to give up their religion with the extreme Protestants becoming more vociferous). The protagonist is young Francis Bacon, a member of Gray's Inn but with ambitions to rise to influence and wealth at Court. His uncle the powerful Lord Burleigh gives him various investigative assignments. in this third volume in the series he is asked to discover the criminals responsible for the theft of religious artifacts belonging to recusant members of the nobility, three of whom were murdered at the time of the thefts. Bacon relies on three very appealing young people to help in solving the crimes, two of whom are also members of Gray's Inn working toward becoming full fledged lawyers. The third is a young aristocratic woman who loves to masquerade as a young man and wants to marry an elderly man so that she can soon become an independent widow. She is quite a handful! the education of lawyers. In this case the particular aspects relate to the rights of widows, the selling of wardships, and, oh yes, just who can be tortured. The plot is fully embedded in the political and religious strife of the period and historical figures, such as Burleigh, the Earl of Essex, and the infamous Richard Topcliffe, are characters. Bacon's mother and aunt also appear and are fascinating characters. This time period is also the setting of Ann Swinfen's Chronicles of Christoval Alvarez and Rory Clements' series featuring John Shakespeare. The three authors know how to bring to life the time and people of the late 16th century. 5.0 out of 5 starsToo much fun. Great fun. Ms Castle has done her homework in terms of history. This is a tale of crime, mayhem and merriment in Elizabethan England. Along the way we are treated with insights into British legal tradition, manners and mores. (I had to check my dictionary to find out exactly what a "doublet" is.) As one who reads actual history books for entertainment, I find Castle's books both fun and informative. This story revolves around a murder mystery, but that's less important than the interplay of characters with their environment and each other. I hope the character of Dirimara, the Native American pirate, will reappear in future episodes. 5.0 out of 5 starsVivid historical detail! In this latest Francis Bacon mystery, Bacon's law clerks, the ambitious Tom Clarady an the studious Benjamin Whitt, must clear their friend "Trumpet," the irrepressible (and, for the besotted Clarady, unattainable) Lady Alice Trumpington, from the wedding night murder of her elderly husband. But he is only one of a number of mysterious deaths which Francis Bacon is looking into, having been appointed to the "recusancy commission" which the Privy Council has authorized to use torture in questioning Catholics accused of trying to assassinate Queen Elizabeth. With the Spanish Armada lurking offshore, and New World discoveries flooding into London, Bacon must determine how and why elderly Catholic husbands are being murdered in their beds--with their rosaries and treasures mysteriously disappearing. Anna Castle brings to life the sights, smells, sounds and history of this turbulent time--you will feel you are sitting in the pubs and walking the streets of Elizabethan England. The plot is secondary -- oops, tertiary -- to character drawing and historical detail. It want to see how Castle handles Kit Marlowe's murder, if murder it was, in Deptford. The characters and stories are excellent in this third book. I read the first book a few weeks ago, and I just started the fourth book in the series. It is best to read then in order, but it's not totally necessary.